In medium bowl, mix all salsa ingredients. Cover and refrigerate at least 1 hour. Set halibut in baking dish or shallow pan. In shallow dish or pie pan, mix remaining ingredients. Dip halibut in marinade to fully coat; place back on pan. Cover and refrigerate at least 1 hour. Heat grill to medium heat. 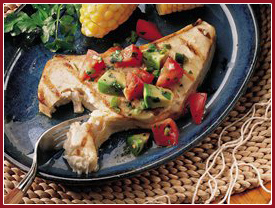 Remove halibut from marinade, reserving the extra. Place halibut on grill, cover, and let cook for 15 to 20 minutes or until done, brushing 2 or 3 times with marinade and turning once. Be careful to not overcook or halibut will dry out. Discard any remaining marinade. Serve with avocado salsa.